Trichogramma are very tiny insects; 5 adults can fit on the tip of a pencil. These predators attack over 200 species of Lepidopteran Caterpillar and Moths that destroy or damage vegetables and fruits. This package will supply you with 12,000 live parasitized Trichogramma Eggs glued on cards. Contains enough insects to control approx. 500 sq.ft. Complete release instructions are included. These insects are biteless, stingless and go virtually unnoticed. Trichogramma have a 100 ft. flying range!! Release at first sight of Moths. Storage: If necessary store unhatched pupa at 40-45*F. Do not cold store the unhatched pupa for more than 10 days. Do not store the hatched Trichogramma in the bag for more than 4 hours. Feeds on: Over 150 Species of Caterpillars and Moths. 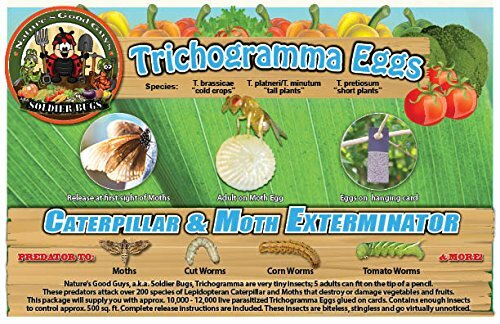 Including: Web Worms, Loopers, Leaf Worms, Fruit Worms, Cut Worms, Boll Worms, Army Worms, Tomato Worms, Corn Worms, Borers, Gypsy Moths, Codling Moths, and Diamond Back Moths. Oriental Fruit Moths and more! Life Cycle: Adults live anywhere from 7-14 days, but can build up to 30 generations per year. Attacks over 150 species of Caterpillars and Moths. Contains enough insects to control approx. 500 square feet. 3 hanging cards containing approx, 12,000 eggs in total. These insects are biteless, stingless and go virtually unnoticed.